Disclaimer: I’m not paid to do this review. I only wrote it because I had a hard time finding a proper review on the net myself. So hope this will be helpful to other potential buyers. I’ve been wanting to upgrade my old low budget stabilizer for some time. 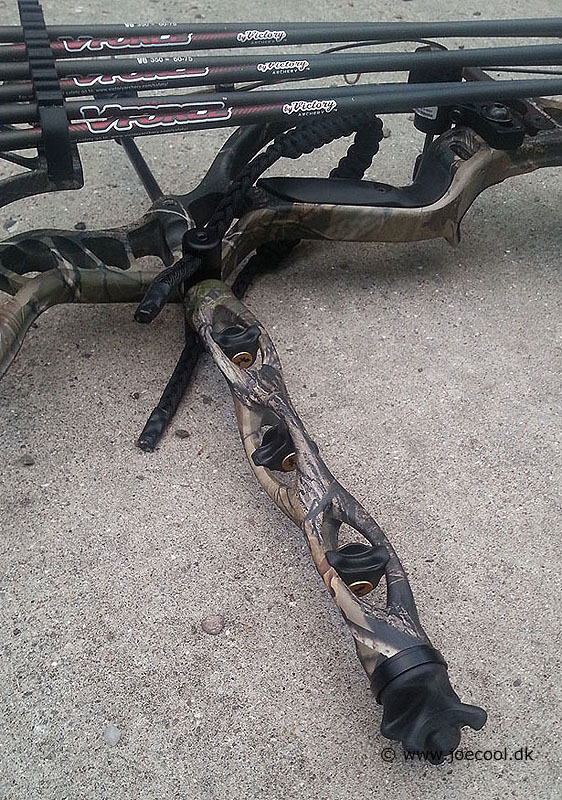 Browsing around the net for last week I decided that since I own a Hoyt CRX 32 bow, a stabilizer with side balancing capabilities was not needed. 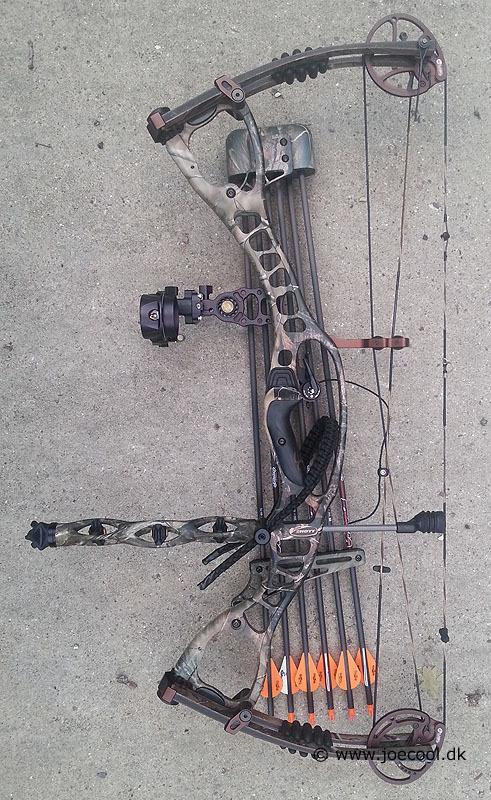 The Hoyt CRX 32 has an offset position for the stabilizer, thus making the feature to counterweight the bow quiver with offset stack weights pretty much irrelevant to me. I also wanted a stabilizer that was straight and looked good. And with that said, I know taste is different. Since there is no archery shops around the corner and plenty of stabilizer producers to choose from, I had to make my decision based on pictures, measurements and scarce reviews instead of feel. It seems there is plenty of experts commenting on how stabilizers are being all that important, but there are very few product reviews. 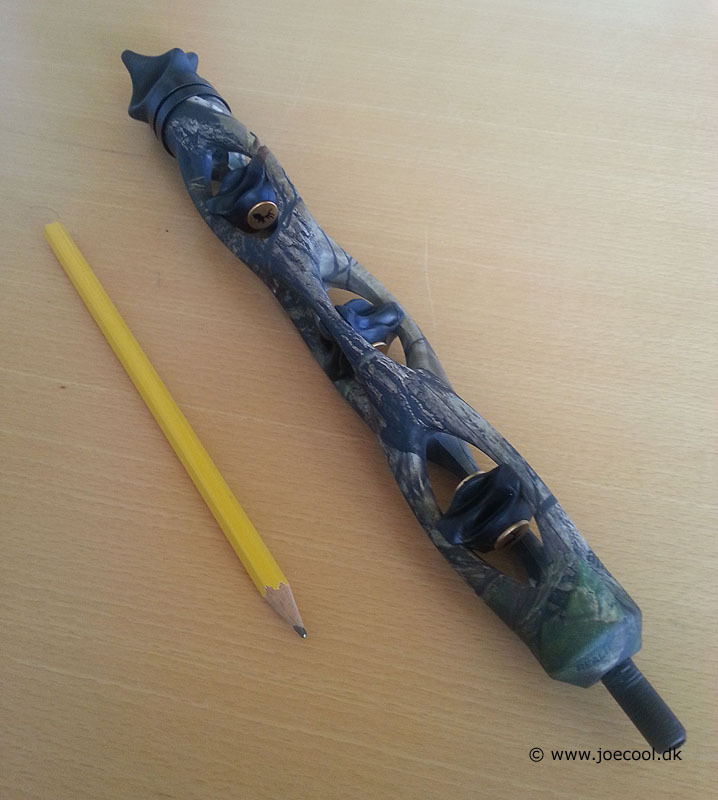 Long story short: as you’d have guessed by the headline, I ended up ordering a Realtree APG camo Trophy Ridge 9″ Static Stabilizer. Here is my review on it. Besides the stabilizer itself, the box comes with a braided sling. For me it’s hard to say whether this is a quality sling or just an average one, but it does it’s job perfectly. Some like leather slings better but personally I don’t care as long as it fills it’s role of letting me relax my grip. For securing the sling, there’s a plate thingy in the box. I mounted this with the stabilizer, but considered not doing so too. It does add weight and it is arguable if it adds anything but extra weight. So some may consider using a leather piece tor this instead. There is no “manual” for using the stabilizer and since I’m a man®, I don’t need any (pun intended). In all honesty, I would have liked a little info on how heavy the weights are and what are the benefits of using the sling securing plate (since I can’t come up with any real good reasons for it). Stuff like that. 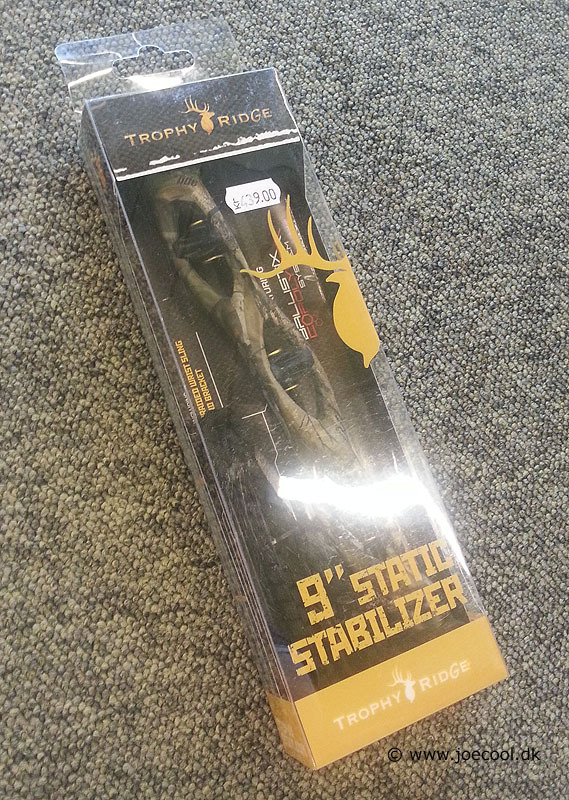 When Trophy Ridge calls it an 9″ stabilizer, its not entirely true. Facts are, that it should have been called 10″ instead. I suspect the same goes for the 6″ version, though I have none to check. I don’t mind the extra inch, but I mention it, because it could prove a problem to people who want to fit it into a bag. Also some countries have rules to the length of stabilizers for hunting. F. ex. here in Denmark the max length is 35cm (13.8 inch). When I got the stabilizer in my hands, the first thing I noticed was that it felt heavier than expected, but that’s a good thing to me. It indicates quality . Especially since you can easily lower the weight by dismounting 2 customizable weights located at the tip of the stabilizer where it should be. If you use both weights and the sling securing plate you add a lot of weight to the bow in general. The customizable weights are where you want them, but the plate for the sling seems irrelevant to me and all I can see it do is add to the bow’s overall weight. Some my find this no big deal, but personally I want light (to a degree) balanced and stable gear. Overall the finish on the stabilizer feels great. 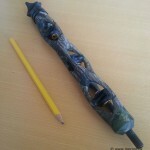 Its solid and the weights and rubber tip is securely fastened. The same can’t be said about the dampeners though. They are not completely secure and even though I haven’t experienced it yet, I suspect that a branch or two could poke one of them out by mistake. Using it over time may prove my fears wrong, but my initial thought is that it could’ve have been made better (edit: They don’t, so no worries there). 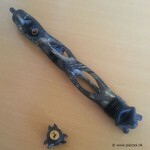 The camo film on the stab is as it should be. It’s not easy to scrape off and has a matte finish. 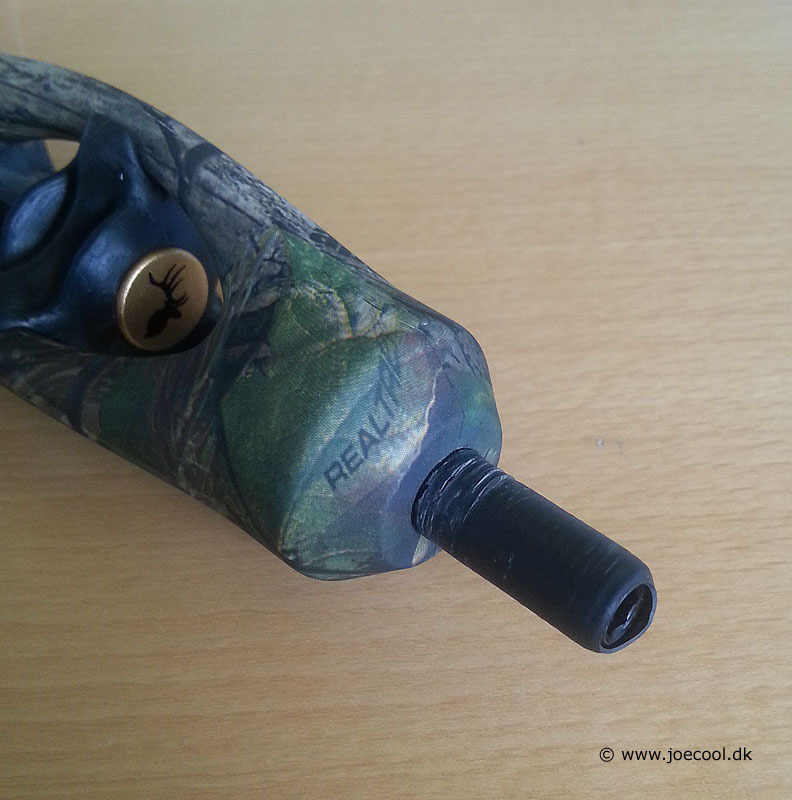 You can get the stabilizer in either black or camo. 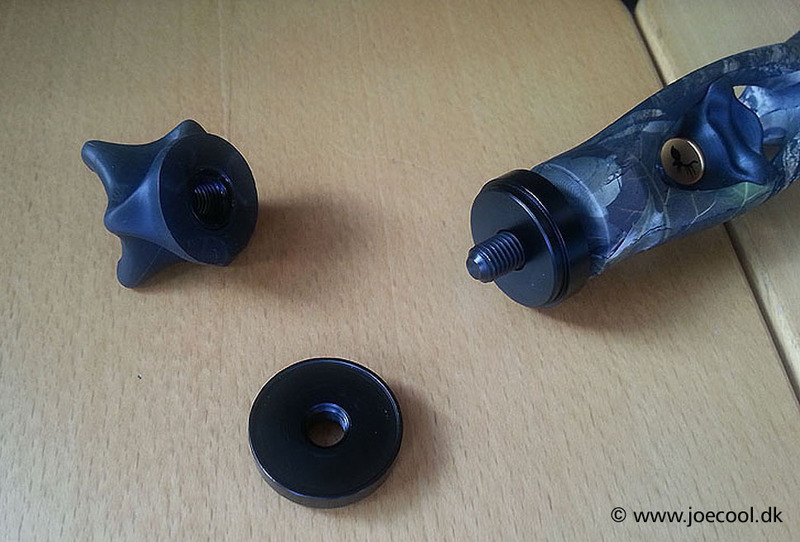 If you’re into pink, its also possible to get the rubber tip and dampeners in pink on an all black stabilizer. 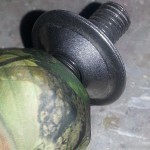 The stabilizer comes with a tiny piece of plastic hiding the otherwise exposed thread. It’s a nice touch and may save the stabilizer’s thread from bumps during shipping. The main feature of the stabilizer is the 2 customizable weights. When delivered, the weights are mounted and they are heavier than they look. 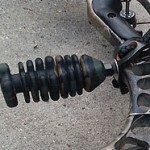 This means that removing one makes a big difference, while removing both makes the Static a real lightweight and in my view also reduces the stabilizer to a mere shock dampener. 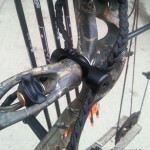 It’s a nice feature that you can adjust the weight and it was on my must-have-list when searching for a new stabilizer. Trophy Ridge also advertise, that the Static was built to let air pass through easily. Looking at the design I accept that this is true, though I suspect this is a minor detail. If the wind catches a slender straight stabilizer enough to mess with your aim, it may be too windy to make a morally clean shot in the first place. The air-pass-through design is a nice tough and I personally find the look it gives the Static pretty great. The plate for securing the sling may be called a feature by some, but as earlier mentioned, I can’t see the point of it. Mounting the stabilizer is pretty easy as with all other stabs. You just tighten it on the bow and off you go. Well, there was a issue for me. I used the stabilizer with the sling mounting plate but still the thread was too long so missed 1 or 2 winds before the stabilizer could hold the sling plate secure. So I had to add an aluminum washer from my old stabilizer. 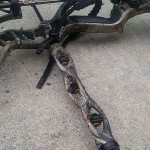 I’m not sure whether this is a Hoyt thing or a Trophy Ridge issue, but it seems odd that it don’t fit. It is possible that the thread could go further inside the stabilizer, but if so, it would need some force. (Note: this has not been a problem with the 2 other bows I’ve used it on). 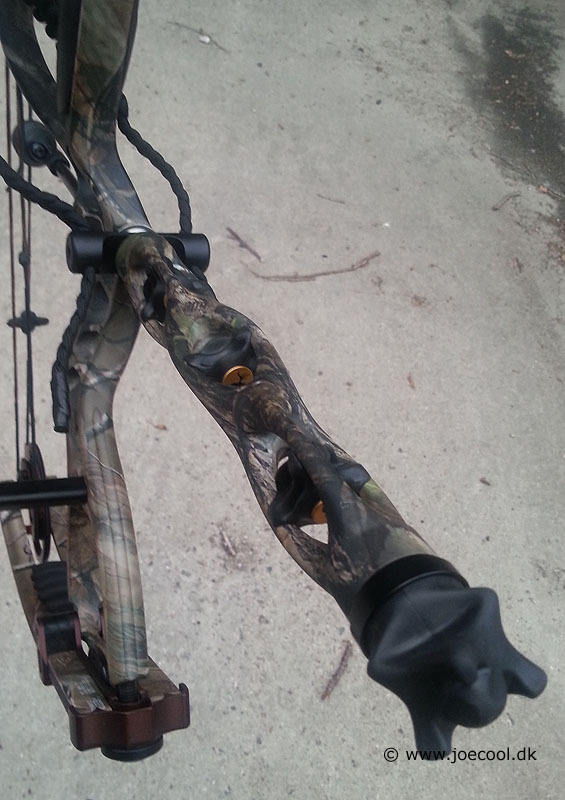 The first time I tried shooting the bow with the stabilizer on, it felt completely different from my old. And that’s in a good way. The pin was way more easy to hold on the target and that’ll help my accuracy a lot in the end. So it does exactly what it’s supposed to regarding stabilizing. It also dampens the recoil, but I can’t tell if it’s any better or worse than before. My bow already stands pretty still in my hand after a shot. Personally I ended up with using only 1 of the 2 weights. I couldn’t see the big difference in stabilizing from 2 to 1 anyway, and when fully drawn, I always end up with my aim below the target. Having extra weight drag down my bow, is therefore not useful in my case, but that’s individual and I’m happy to have the choice. If you completely remove both weights you might get a better balance and no nose-diving, but then the stabilization suffers. And what’s the point of a stabilizer then? This is compared to my bow, and your experience may vary. Overall the quality of the stabilizer is good. When you hold it you can feel it’s a tough product. 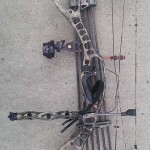 It helps a lot with stabilizing the bow compared to my old low-budget stabilizer. So the upgrade is worth it indeed. I can’t feel any change regarding dampening, and if there is one, it’s tiny and not enough reason to upgrade. The design is excellent. Some may argue that the â€˜holed’ design may tempt branches to get stuck when you move around in vegetation. 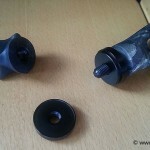 I’m not to say, but I’ve seen many stabilizers that are bulkier and in my opinion prove a bigger problem. The Static is slender and straight and you know where it is pointing at. 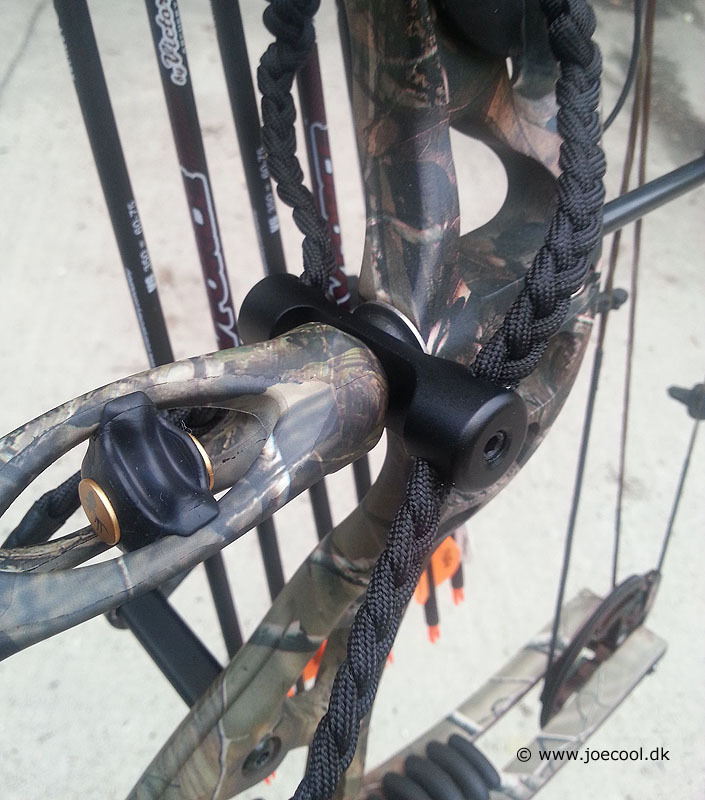 For a stabilizer the 9″ version may seem long for some, but that depends on the person and your bow’s design. 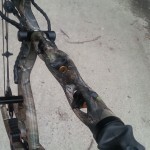 My Hoyt has a stabilizer fitting way back on the riser (reflex bow design), while older bows tend to be inline or deflex leaving the stabilizer sticking more out in front. To me the length is just right for my bow and in hindsight I’m happy that I didn’t pick the 6″ version. I might argue differently after a hunt if the 9″ version gets in the way at a critical stage. The only real downside to the Static is the 3 dampeners feels like they could fall off by mistake (Edit: They don’t! No budging after using the stab for more than 1 year). I bought the stabilizer for 478 DKR / 85 USD (incl. postage) here in Denmark (yes – we get ripped here in Europe). You can get it way cheaper in the states. A quick search said between 40-50 USD, which is a bargain for a quality stabilizer in my opinion. Dampeners not fastened enough and may prove a problem over time (Edit: Time has shown, that they aren’t). I found this review linked on Amazon. 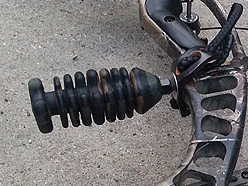 One note on your comment about losing the internal free-floating vibration dampeners; they’re not attached on purpose to aid in their ability to disperse vibration. Also (and more imprtantly) if you lose them, Bear (who I owns Trophy Ridge) will send you out some new ones. I sent them an email wanting to get two more of the weights and they sent me two weights, 3 of the intrenal dampeners and a new end cap free of charge. Thanks for dropping by, and cheers for the input regarding the dampeners. I simply wanted to say thank you for the review. 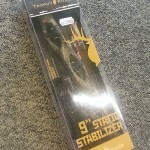 I to looked around and found this stabilizer to be the right price and quality. However, there were no instructions included with the stabilizer. Being a first time bow hunter at age 30, I know that understanding what your using makes all the difference. It would be irresponsible of me to hunt bow if I did not fully understand how the stabilizer could bennift me by adding or removing a weight. Thank you for your review and time. Cheers and good hunting this season! Thank you for your comment. Happy that the review was helpful. Good hunting to you too. Those 3 inserts most likely will not fall out unless you really try. I actually was quite surprised by how firm and well they were held in as I it wasn’t that easy to get them out. Anyway thanks for the great review.PS the threads being to long is a problem with the bow you are using not the stabilizer as I’ve never heard of that problem before. You are correct. After using the stab for a longer period, none of the inserts has fallen out yet. So my final conclusion is that its no problem. The thread issue is no problem on my 2 later bows, so I suspect you are correct. Still the best review on line that exists for this priduct! I just bougt the 6 and 9 and cant wait to compare! Thanks a lot. Happy hunting! Great review!! Was very helpful and I love the edits after you have had it for a year. Thank you for taking out this time. I found the link on archerytalk. So I have used the 9″ stabilizer for quite a while and have been using it with no problems. Now that I have started competitive indoor shooting I noticed that many of the guys have much longer stabilizers. 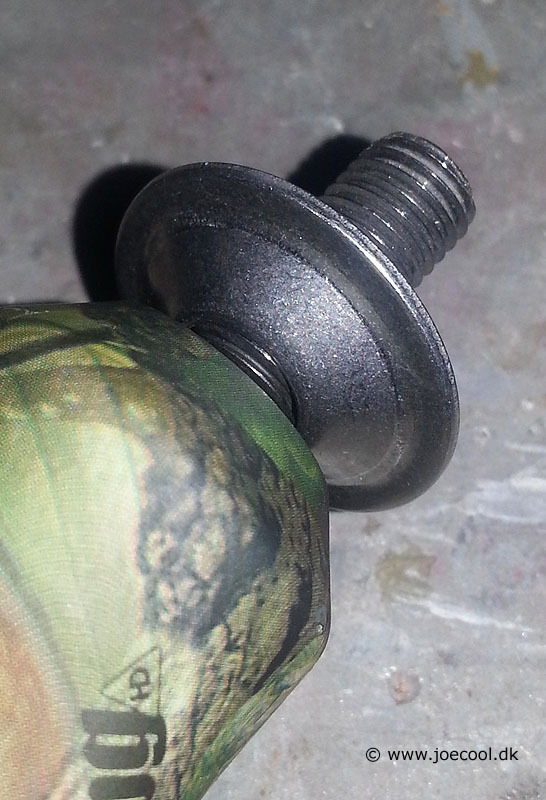 But since I am very happy with the Trophy Ridge stabilizer (TR), I called TR up and they informed me that I could simply screw additional stabilizers into my existing 9″, therefore lengthening it. I have since ordered an additional 9″ and a 6″ and am experimenting between the 15″, 18″, and 24″ combinations with very happy results so far. Thanks for the great review. You guys do get ripped off in Denmark. What can you bow hunt for in Denmark? Mostly bowhunters hunt roe deer, pheasants, fox and the occasional hare. The biggest we’re allowed to hunt is roedeer. Recently there has been talk of allowing bigger game. That would be doe deer, sika, elk (we have a local variant called Krondyr), boar and mufflon. But it’s still uncertain if the government will allow it. Many green NGO’s try to minimize or stop hunting all together, so I think most Danish bowhunters are happy to just to have the opportunity at all. Sweden and Norway, for example, do not allow bow hunting at all.